The NFL is all about protecting “the shield.” Everytime there is a problem going on in the NFL, the league (particularly Commissioner Roger Goodell) talks about how the league has to protect its image & punish sternly for players who violate the personal conduct policies set in place by the league & enhanced by Goodell when he became commissioner in 2006. But what happens when the person who is violating the personal conduct policy is one of the NFL owners as well as someone who helps pays for Goodell’s salary? This week, Indianapolis Colts owner Jim Irsay was arrested & accused of 4 felony counts of DWI & ownership of prescription drugs that weren’t his. Will Irsay suffer serious jail time? No, not happening. Not for a man of his level & his financial standing in society. But, this absolutely crosses the line in the pantheon of the NFL rules about protecting the image of the league. Irsay has had a history of erratic behavior, mostly because of his intense involvement in social media through Twitter & being an owner who was more open about interacting with fans about their concerns, many times to his own detriment. The league is at a big moment right now. In order to keep the trust of the players & to keep the players’ trust, Goodell needs to send a message to Irsay with a stiff financial fine & no day-to-day operations of the Colts franchise until the end of the 2014 season – the day after the SuperBowl. A punishment, in terms of time, that would be similar to what New Orleans Saints Head Coach Sean Payton had to endure during the BountyGate situation in 2012. Jim Irsay clearly has a problem that has a far bigger impact personally than what he does with his upcoming NFL draft pick. He has an alcohol problem & possibly a drug issue that is now going to come to the forefront. He has taken the first step & checked himself into a rehabilitation facility, but he has to be punished for what he did. It has to be stern & it has to be worse than what a player or general manager would receive because of the fact that the ownership is supposedly held to a higher level of respectability & is supposed to set a clear example to other employees of the NFL. 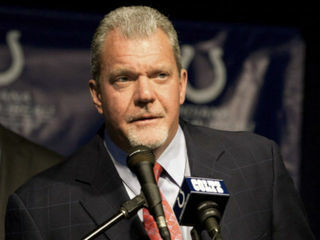 Irsay needs time to get his life together, & overseeing the day-to-day operations of the Colts can’t be a part of that. He has to get away from all of that to get his overall health & life together before the situation gets very worse. Goodell has had various moments as commissioner to wield his power around & show he is a no-nonsense commissioner, but this would be the ultimate blow to a higher authority, who authorized him & voted him to be the head of the NFL. A strong message here will go a long way in Goodell earning overall respect from this era of players who, many have gotten in various run-ins with the law. Time for Goodell to protect that shield. For more information, please visit the DraftKingsMaster on Facebook, Twitter, Google Plus, & Pinterest.